I am working on a set of drawings on Hanji paper, which is the traditional handmade paper of Korea. The Youngdam Art Museum invited me to participate in this project. Youngdam is a Buddhist nun famous for maintaining the tradition of Hanji papermaking in Korea. She is also a remarkable artist, which stems in part from her sensitivity to the materials of paper and nature. It’s both a challenge for me, and an honor, to work with this paper. While I have always used paper in drawing and keeping sketchbooks, my primary medium has been oil painting. I like oil paint because it has patience with me. The process can be as long as I need and yet the paint preserves the actions of drawing, of gesture, of emphasis, of any introduced movement. 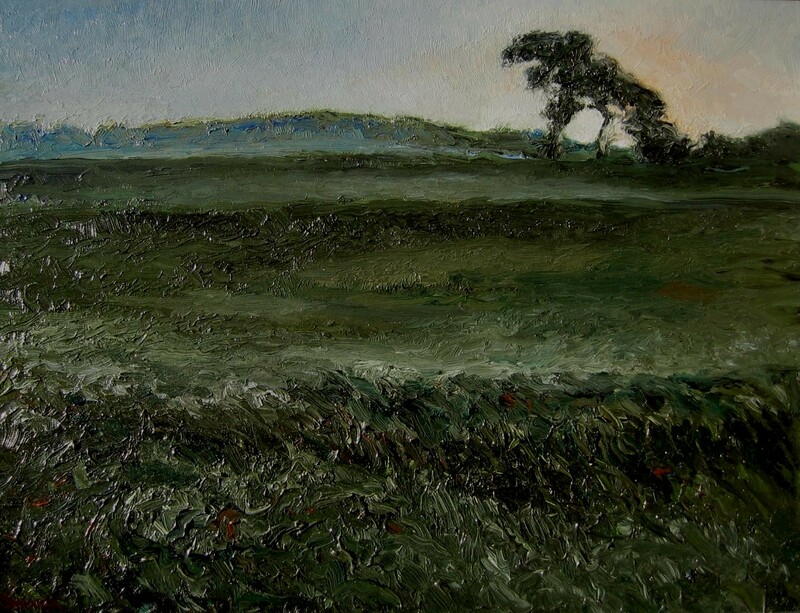 My paintings follow the landscape and figures which I may notice there. 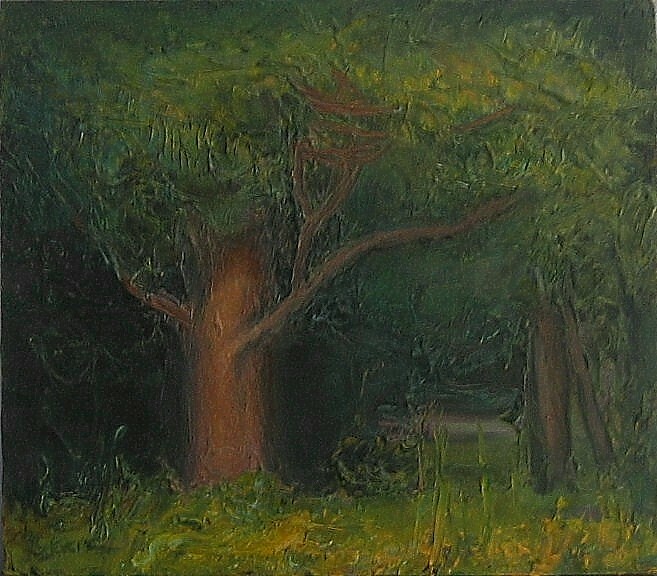 I paint in a number of ways: plein air, from memory, from drawings, and from the imagination. The way I paint has origins in Impressionism, both for the interest in contemporary subjects, but also in the attempt to hold together an excited field of paint. This is to some extent the challenge of painting to me – how to excite the mind in a still reflection. In painting we consider the world as a long moment, with little movement. Delacroix used to fascinate me for his efforts to generate motion in his images, but then I saw it was only his emotion he was painting, as Van Gogh does in another way. Ultimately, thanks to the evidence I’ve been able to gather from teaching others, as well as from my own practice, I find the gesture of painting is unique to each individual. You might say this is a little like handwriting, but in painting there is a lot more of the body’s gesture available to enter the painting. I often use the analogy of the violin soloist when I teach, to encourage standing while painting and using the full length of the brush. In the violin section, the soloist is capable of virtuoso expression mainly because her entire body can play the bow across the strings. It even makes the playing more forceful, louder, and impassioned. I feel I would not be as far along in my own work, if I hadn’t also taught now for about 15 years. Well, teaching is not collaboration; it is more like coaching. 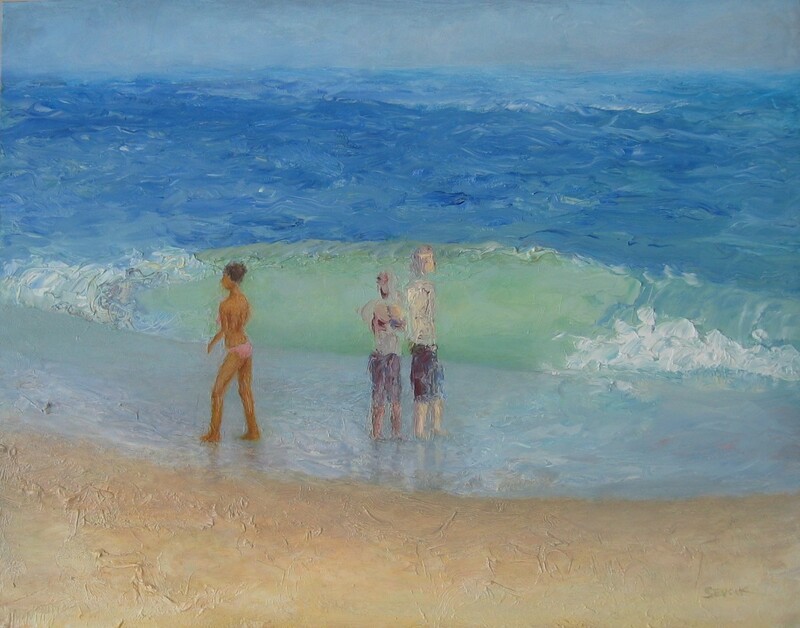 The instructor tries to notice what the artist working with him is doing, and how to help. I may even help by reading the painting in progress, because it shows a particular metaphor, or sensibility that the artist doesn’t recognize yet. I have often found students in agreement with me that during a group critique we learn more about painting from other’s work, because we see the originality, problems and solutions more clearly there. Also, many students undervalue their most original and brilliant work, but I and their fellow students sing its praises. The same subjectivity that gives rise to originality can blind a student to a recognition of what has been accomplished. A shift must occur that takes us from the dream state to the objective state of seeing the piece from the outside. So to me, helping others actually pays great dividends in understanding the pitfalls I, too, fall into, and from which I must extricate myself. I also have the teachings of my own instructors still in my ears, as well as those like Robert Henri, John Sloan, Van Gogh or Cezanne, whom I read. But in terms of direct collaboration, I don’t think most artists have that view of what they do, including students. I feel we plumb our own individual wellspring, and it is the diversity of outlooks that make art such an interesting community of views. Somehow, we all collaborate on the meanings of these things, the way spoken language seems to cohere to all of us, not only as a set of past meanings, but also in its new ones. For the past few years I have tried pushing pieces I had come to a finish or impasse on, and it has promised to be the way I will be working for the near future. I also suspect my present work with Hanji paper may influence my new painting in some way. Bird watching with my wife. Anything we do together is actually fun. I also run, which I enjoy for its solitude and society (they take turns with the miles you pass). Painting is also my fun, though a serious kind of fun. I also like to write – I’ve had plays produced in the past and poems published. I still give readings from time to time and keep a blog of poems going and another of art essays. Especially when I am teaching my mind is occupied by all the situations of individuals, their art, what I said, what I should say next, how to understand the direction of their development and how to help. When I paint, there is almost no need to think ahead of time. I need to think while doing, and visual thinking has the advantage of being silent. Perhaps because I am rather verbal, my ideas sometimes come to me in words for essays or the opening of a poem, while running. Otherwise I am influenced by the news like the rest of us, for or against. There are to be two invitational exhibits of the works on Hanji paper, one in Seoul, and the other in either New York or Philadelphia. My paintings are in Bryant Street Gallery in Palo Alto and in Kevin Butler Gallery in Edgartown, Massachusetts. Any past exhibits you’d like to mention? I won a faculty fellowship prize at Fleisher Art Memorial where I teach, which included a one-man show of my work. I was interested in myth and landscape, particularly how landscape itself seems to invent the mythic probability in certain places, as well as in paintings of those places. You can think of Anselm Kiefer, Diebenkorn, the natural setting and valley at Delphi for an inkling of what I mean by this. I’ve also participated in a number of benefit shows: Dear Fleisher, Plein Air for Camphill, The Cheltenham Center of the Arts fundraising auctions. These are good experiences to have. Much less than I am. In painting I can only think of one painting I ever did that might be called political. In poetry and playwriting I’m sometimes a little more so. Politics are part of life, but I think what artists often turn to is the deeper wavelength from which a certain politics, a certain civility, arises. When I take my students to the art museum, I lead them to consider the pieces with a different theme in mind each time. It amazes me that for centuries painters and sculptors have posited empathy, compassion, protested cruelty, and by these sentiments achieved civilization. Just when you think it is all religious, you realize what it is trying to do and how the idea of the miraculous stems from the sudden conversion to an outlook of love. As I say, these artworks operate on viewers to create empathy and oppose cruelty, to comfort us from terrors we cannot ultimately avoid, and therefore they study how to live. We in our time come along and see the work unfinished – cruelty still practiced, tolerance imperfect – and so the work of spirit, and civilization, go on. Beauty, free time, the impressionist gift of color are all swept up in this communal interest in how we are not only comforted, but even grateful, ecstatic, for life. You raise awareness through beauty – of what you can feel, of how divine an experience can be. I am sure it is a form of medicine, as well as a practice of metaphysics, to enter the art experience as an audience. More so, really, than as an artist, though we are all sometimes in the audience, and lucky us for that privilege. I am not, unless you count my activities as an art instructor. Of course, I am a citizen of this country, and of the world. The first is a formal belonging, with voting and involvement of the sort we know; but the other is an informal belonging. That belonging to the world tests our involvement in the country we belong to and how it belongs to the world at large. What are you currently interested in? I have been turning over in my mind the experience of seeing Werner Herzog’s “Cave of Forgotten Dreams,” which is a documentary with very fleeting views of some of the oldest cave art by human beings in Europe, possibly 32,000 years old. There is 40,000 to 60,000 year old art in Australia, just to put this French cave in perspective. The subject makes me attempt a form of writing that might explain some of the ways and purposes of art. As an artist I would love to see these works for myself, because I think too many of the people who study such art are not themselves artists, and so are impressed by what we would be casual toward, and they perhaps overlook what an artist could read as significant intention. I wonder how I would read these galleries, if I could visit. I have many questions based on what I have seen in photographs and read. Another mystery I am interested in a lot is the Taklamakan Desert in Central Asia, site of the old silk route. I just finished reading “Foreign Devils on the Silk Road,” an account of controversial archaeology that went on there by outsiders from the end of the 19th to the middle of the 20th century. In the Paleolithic era there were giant lakes there, inhabited by people, and great cities survived until perhaps Marco Polo’s time, fed by melting glacier water. But even by then it was the most inhospitable desert. Enormous Buddhist temple complexes and monasteries spread around this desert, and it was the meeting place of Hellenistic influence, Indian Buddhism and Chinese civilization. Buddhism passed along this way to reach China, Japan, Korea and Siberia. It also seems like a model of climate change, and because it preserved so much of what happened there it even speaks to us as a cautionary tale. In fact, I am also reading the Dalai Lama’s memoir “Freedom in Exile,” which dovetails with the other text in exploring the place, or failure of, Buddhism in the real world of cruelty and power politics. As an artist, as a human being, I want compassion to win out, but the historical instances of its failure are too blatant to ignore. I can add what happened in Europe in my parents’ time to this, or Rwanda and Kosovo in ours. There is a fundamental difficulty in our world which art perhaps would like to fix, but hasn’t been able to. You could even say art contributes to differences in the sense that it identifies its cultures as unique and other than. Even though religions have very slight differences, sometimes only sectarian ones, we know people can fight over their differences. With art it is not as contentious, but even armies have dressed differently to recognize themselves from the others. There is a possibility of dissent between groups based even on the practice of science, or differences between results: you can think of economics on either side of the Iron Curtain, or ideas about genetics, which varied disastrously in Germany before and during World War II, or under Stalin in Russia for a while. What websites do you visit each day? BBC, MSN, for news; facebook, and checking email. Google is very useful in helping me research background for some of my poems and essays. What types of music/ audio are you listening to these days? Jazz on WRTI, Leonard Cohen, Dvorak, Smetana, NPR. Wissahickon Park, The John Heinz National Wildlife Refuge, the museum of art. 1. 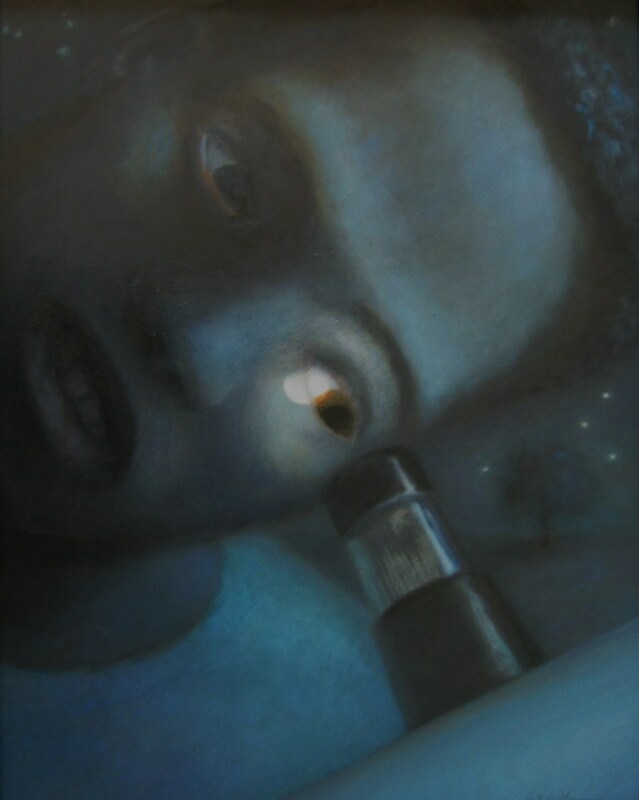 The Moon Gazer, oil on masonite, 14 x 11 in. 2. Venus Passing, oil on masonite, 11 x 14 in. 3. Atlas Was a Woman, oil on canvas, 12 x 14 in. 4. 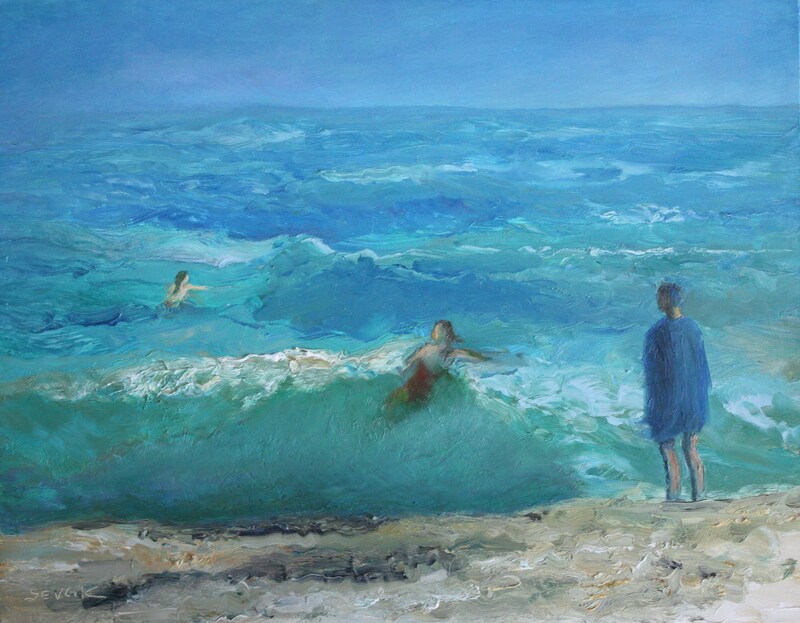 Late Day, Heavy Surf, oil on masonite, 11 x 14 in. 5. 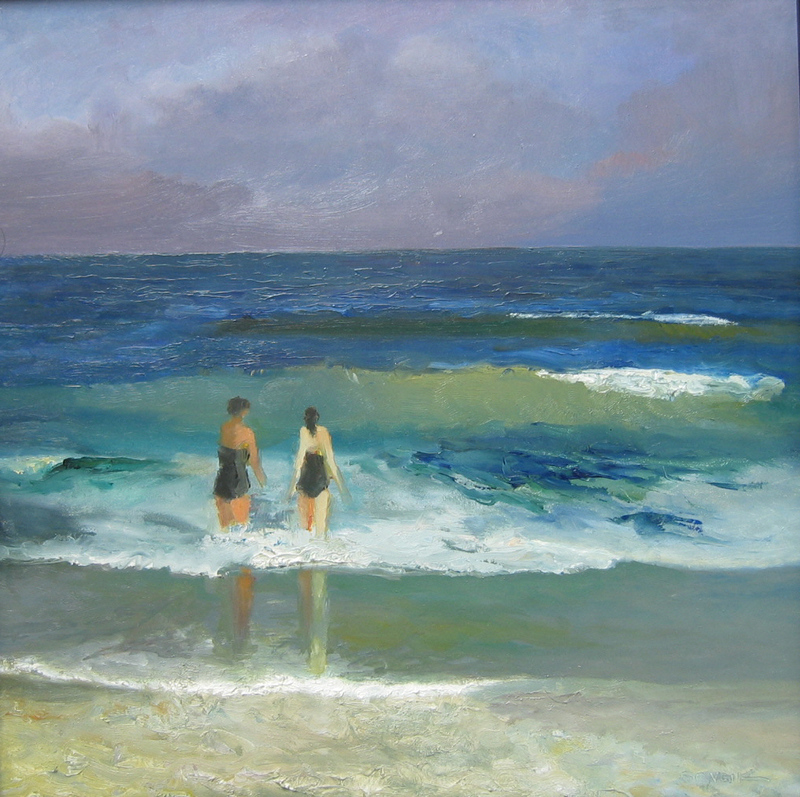 Atlantic, oil on masonite, 12 x 12 in. 6. 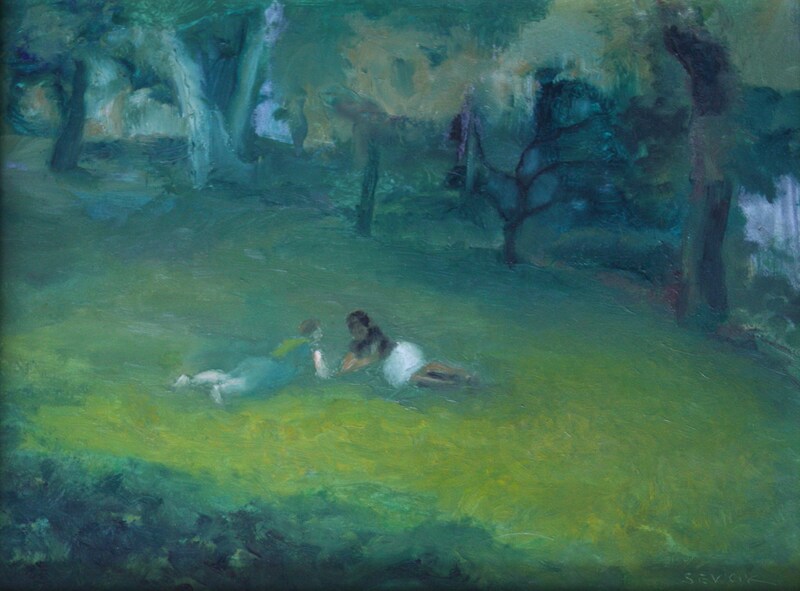 Couple in Park, oil on masonite, 9 x 12 in. 7. 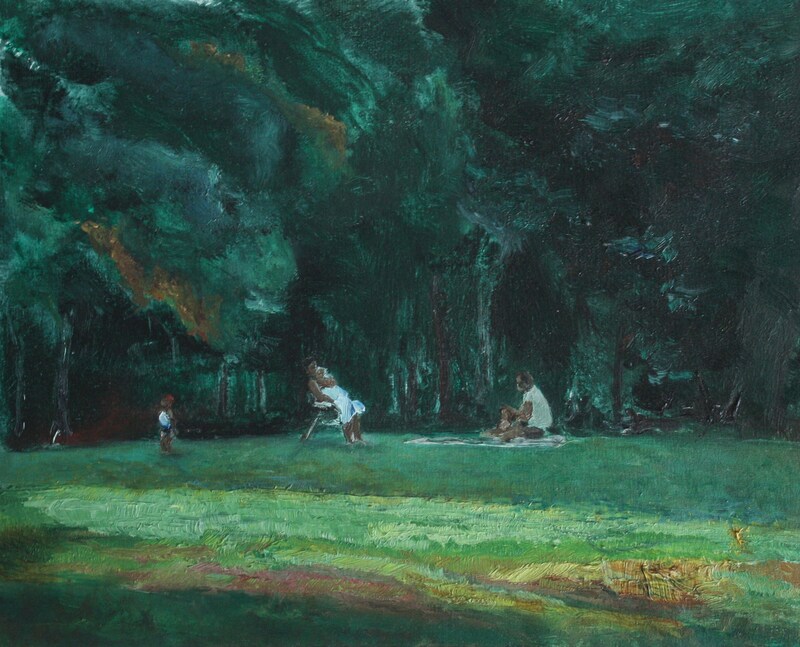 Family at Valley Forge, oil on gessoed paper, 7.25 x 9 in. 8. 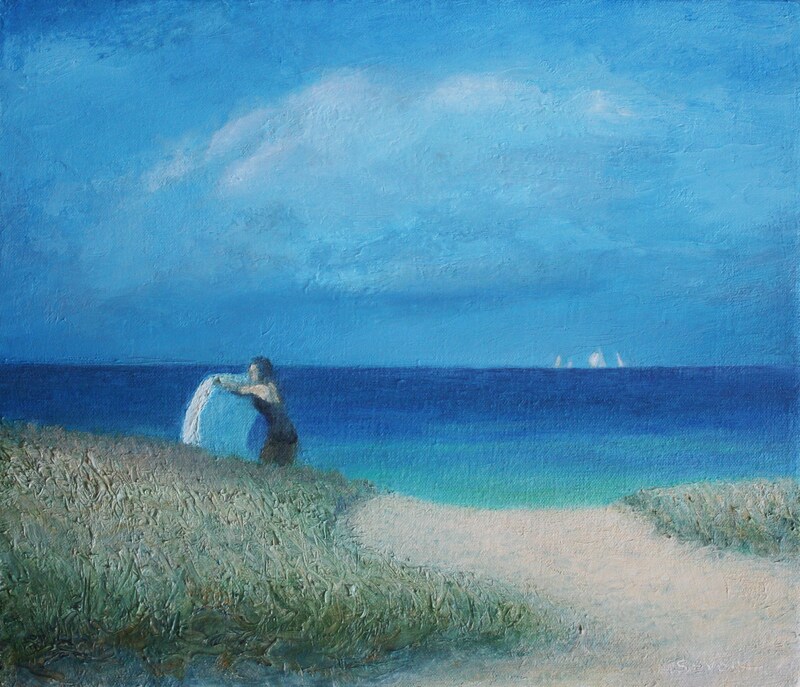 Summer’s End, oil on board, 5.5 x 6.25 in. 9. 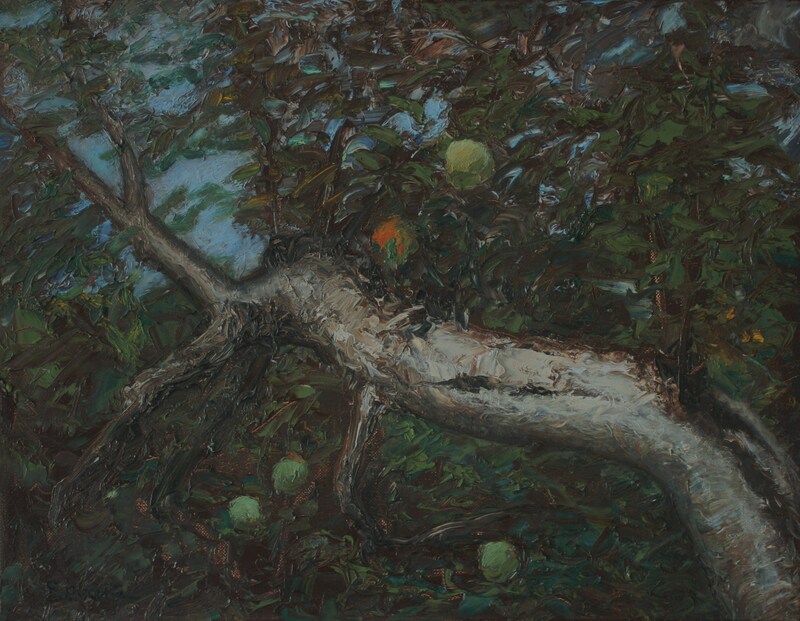 Apple Tree (interior), oil on canvas, 14 x 18 in. 10. Ghosts (Valley Forge, 2 a.m.), oil on board, 8.25 x 11 in.